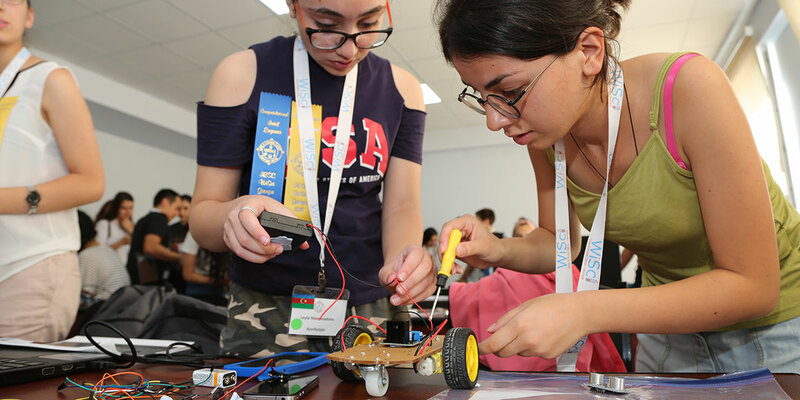 In August 2018, 100 girls from Georgia, Armenia, Azerbaijan and the United States attended WiSci Georgia, a camp in Tbilisi focused on building skills in leadership and STEAM (science, technology, engineering, arts and math). MCC partnered with the UN Foundation’s Girl Up campaign, the U.S. Department of State, Google, Microsoft and Intel for the Women in Science (WiSci) camp. MCC seeks to partner with organizations that share our goal of achieving poverty reduction through economic growth. Building partnerships with MCC starts with defining a shared vision of what we want to achieve together, and then leveraging the strengths of each partner to address our core interests. While some partnerships are short-term and limited in scope, we believe the most effective partnerships are sustained over time, and extend beyond a single project. All partnerships must be rooted in a shared objective and include shared risks, responsibilities, and rewards. MCC partnerships take many forms and benefit both MCC and our partner organizations by increasing our respective access to cutting-edge research, knowledge, data, funding, networks and expertise. Partnerships can help open new markets, scale programs, drive innovation, and transform the lives of people around the world. If you are interested in working with MCC to explore cutting-edge issues in economic growth and poverty reduction, deepen stakeholder awareness and engagement around our programs or model of delivering foreign assistance, or have a network you think MCC should join, please contact us. MCC invites organizations to propose ideas for working with us to address specific needs through MCC’s Annual Program Statement (APS). The goal of the APS is to foster collaboration and partnerships to reduce poverty through economic growth. Together we can advance our mutual organizational interests and achieve sustainable development impact. MCC believes that private sector expertise and approaches are key to bringing innovation, cost-efficiencies, and sustainability to MCC programs. We are open to working with companies to identify employee engagement projects in furtherance of MCC’s mission and programmatic goals in MCC Partner Countries. Our programs range from youth engagement and employability to water and energy system improvement and access. If you have an idea and would like to start a discussion on how to link your employee engagement program to our projects, please contact partnerships@mcc.gov. To help transform Georgia’s education system and improve earning potential for Georgians, MCC signed a $140 million compact with the Government of Georgia in 2013. A unique partnership with San Diego State University (SDSU) is a key component of MCC’s Georgia Compact. SDSU now offers degrees in science, technology, and engineering fields to students in Georgia without leaving their home country. MCC is looking for additional investors to support the program’s sustainability beyond the agency’s five-year program, because while the tuition in Georgia is lower than what California residents pay to study, SDSU-Georgia fees of $7,500 per year are a significant barrier for Georgian students. Mentoring and career support services; and more. MCC’s Morocco Employability and Land Compact includes initiatives to improve education and land governance. If you are interested in partnering to support technical and vocational skills development and education in Morocco, please visit the MCA-Morocco website (in French) to learn about a new grant program known as Fonds Charaka (Partnership Funds). If you are interested in supporting initiatives to improve existing industrial zones or develop new sustainable and high performing zones in Morocco, please visit the MCA-Morocco website (in French) to learn about a new grant program known as FONZID, or Le Fonds des Zones Industrielles Durables (Sustainable Industrial Zone Fund). Strong Country Relationships: Our country ownership model means we develop strong relationships in our partner countries at the highest levels of leadership. Sustainability and Scale: Our investments support models and approaches for economic development that strive for scale and replicability. Partnerships offer a unique proving ground for subsequent operations and investment within our time-limited compacts and threshold programs. Proven Expertise: MCC’s staff and the country partners who oversee our investments on the ground have deep sectoral and country knowledge, and we work with key influencers and implementers who are driving economic growth. Systematic Approach: We understand that to achieve poverty reduction through economic growth, we need to invest in policies, institutions, people, and infrastructure—and we tailor each of our investments to address the unique needs of our partner countries. Value Partnership: We know we need smart, innovative, dedicated, and thoughtful partners who are willing to invest alongside us to drive sustainable growth and reduce poverty. MCC partners with companies, financial institutions, foundations, universities, non-governmental organizations, faith-based organizations, development agencies, and fellow U.S. government agencies, because we know partnerships increase our shared impact. Knowledge and Information: We look to collaborate with organizations that have specialized knowledge, information, and data. Together we can work to stay on the cutting-edge of development using new tools, research, and methods. Networks and People: An ideal partner not only brings their unique talents to our mission and programs, but also brings a like-minded network of associates that help us engage a wider group of stakeholders. Innovation: We value new ideas, new approaches, and more effective and affordable products and services that help us work more productively. Quantifiable Investment: We aim to use our public resources to attract additional investments. Whether through direct funding or other tangible contributions, we are looking for partners that want to invest with or alongside MCC. Value Partnership: While partnership is a powerful tool for achieving shared goals, it is not always easy and requires flexibility and patience. We look for partners who are ready to co-create, learn with us, and continually reflect on how we can best achieve our individual interests and shared goals. We offer partnership opportunities with both MCC directly and with our country counterparts. MCC recently entered into a new partnership with Kuli Kuli, a U.S. company creating products with a nutritious leafy green called moringa. The partnership includes an MCC grant to conduct a market assessment in order to help MCC understand the opportunities for companies obtaining moringa from Niger. Kuli Kuli is bringing their expertise and resources to conduct the assessment, which will evaluate current moringa growing and processing capabilities in Niger and propose to MCC future ways to operationalize moringa export to inform the oversight of MCC’s $437 million Niger Compact. MCC signed a partnership agreement with the U.S. Department of State’s Office of Global Partnerships to increase MCC’s participation in future Women in Science (WiSci) camps around the world. This agreement has the potential to expand MCC and the U.S. Government’s reach in supporting women’s empowerment and enhancing science, technology, engineering, arts, and math (STEAM) education for girls around the world. Promoting gender equality and supporting women’s economic empowerment is fundamental to achieving MCC’s mission and empowering women leads to stronger economies, increases in household incomes, and private sector growth. MCC recognizes that investment needs in our partner countries far exceed the funding we can provide alone. That is why MCC and the Organisation for Economic Co-operation and Development (OECD) have signed a partnership agreement to help catalyze investment in the developing world. By matching the extensive research in MCC’s Constraints Analyses with the OECD’s Multi-Dimensional Country Reviews (MDCR), we create an opportunity for the development community to focus and inform their investment decisions and maximize their impact. MCC and the U.S. President’s Emergency Plan for AIDS Relief (PEPFAR) have partnered to support innovative, country-led approaches that demonstrate evidence-based decision-making for global health, gender equality, and economic growth programs and policies. MCC is a world leader in the use of data for the design and implementation of large-scale development programs, and PEPFAR has saved millions of lives through its innovative approach to achieving an AIDS-free generation. MCC is advising on and overseeing several PEPFAR-funded activities that use data to improve programs, policies, and decision-making that advance the mission of both organizations. MCC established a partnership with The Coca-Cola Africa Foundation (TCCAF) in 2013 to expand access to clean water and sanitation in Africa, starting in water-poor Cabo Verde. Through the Replenish Africa Initiative (RAIN), TCCAF invested alongside MCC’s work to help 20,000 low-income households gain access to the water network and provide sanitation and hygiene education to thousands more. Our co-investment helped TCCAF reach its RAIN commitments and expand its program into a new country. The Green Prosperity project in MCC’s Indonesia Compact includes a grant facility designed to increase productivity, reduce energy costs and improve natural resource management. The facility invites the private sector to propose innovative solutions that benefit rural communities through investments in renewable energy and sustainable management of Indonesia’s natural resources. The grant facility finances the best proposals while leveraging additional private sector capital to invest in projects that drive rural productivity. Grantees include the Rainforest Alliance (with Olam Indonesia and GrowCocoa), Swisscontact (with World Cocoa Foundation and Barry Callebaut, BT Cocoa, Cargill, Guittard, Mars Inc, Mondelēz and Nestle), Euroconsult Mott MacDonald (with Athelia Climate Fund, IDH, ISCC, Prosympac Agro Lestari, and UK Climate Change Unit), and the World Wildlife Fund. As part of MCC’s Jordan Compact, the agency supported the expansion of the As-Samra Wastewater Treatment Plant with a public-private partnership (PPP). The Government of Jordan delegated financing, construction and operation of the plant to the private sector for 25 years, leveraging its expertise, creativity, know-how, and efficiency. With its $93 million investment, MCC helped mobilize an additional $110 million in private financing. Together with MCC-funded upgrades to the country’s wastewater system, the plant expansion is expected to benefit 375,000 households. In 2011, U.S. pharmaceutical company Merck donated 14,000 vaccines to help protect Mongolians against cervical cancer. While Merck covered the cost of the vaccines, all operational costs of program implementation were covered by MCA-Mongolia and the Mongolia Ministry of Health as part of MCC’s Mongolia Compact. The partnership expanded MCC’s investment in non-communicable disease prevention while enabling Merck to test the compact’s implementation model prior to scaling up. The partnership helped open the doors for further investment in health from the private sector in Mongolia. As part of our compact with Liberia, MCC joined the Government of Liberia and several European financing partners to fund the rehabilitation of the Mt. Coffee Hydropower Plant. The rehabilitated plant will produce an additional 88 megawatts of clean, renewable, affordable power that will bring more reliable electricity to the people of Liberia − the overwhelming majority of whom do not have access to electricity. To promote the sustainability of MCC’s education investment in Namibia, MCA-Namibia partnered with MyDigitalBridge Foundation and Microsoft to pilot a TV White Spaces (TVWS) project for broadband access. The partnership was established to develop unused TVWS to deliver fast, reliable, affordable broadband access to 23 rural schools and 10 local administrative offices across Namibia. At the time of the pilot, it was the largest TVWS project of its kind in the world. Outreach Events: MCC convenes local roundtables with Chambers of Commerce, trade groups, associations, and interested private sector and civil society partners to discuss collaboration opportunities. Stakeholder Consultations: MCC conducts consultations across the United States and internationally as a key part of program development and implementation. At its headquarters in Washington, D.C., MCC hosts an event series that gives NGOs and other development organizations an opportunity to engage with MCC during our compact development process to leverage shared information and extend our impact. Smart Aid Series: Smart Aid is an event series designed to promote the sharing of best practices, innovative approaches, and lessons across a range of development topics to foster greater collaboration and advance effective aid distribution. Overseas Events: MCC partner countries occasionally host public events. Contact us by email if you are interested in events taking place in an MCC partner country. Invite Us: MCC may also be able to come to your event and share information on our approach to partnering and current partnership opportunities. Contact us to let us know about your event.